Lubrication is the process, or technique employed to reduce wear of one or both surfaces in close proximity, and moving relative to each other, by interposing a substance called lubricant between the surfaces to carry or to help carry the load (pressure generated) between the opposing surfaces. The interposed lubricant film can be a solid, (e.g. graphite and MoS2 etc.) a solid/liquid dispersion, a liquid, a liquid-liquid dispersion (a grease) or, exceptionally, a gas. 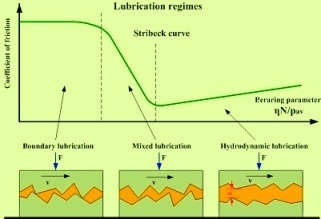 Types of lubrication are shown in Fig 1. Act as a coolant to remove the frictional heat which may be sometimes considerable. It dissolves and transports contamitants and debris arising both from internal and external sources. It offers protection against the accumulation of deposits (sludges and varnish) in lubrication system. It resists or aid emulsion formation in wet systems. It has ability to separate water coming from air breathing or external sources. Some of the above functions are catered to by any properly refined mineral oil of suitable viscosity while for some other functions are provided by the lubricants with the help of additives. The types and amount of additive needed depend upon the performance features which a lubricant is reqired to meet. Typically lubricants contain more than 90% base oil (Mineral oil) and less than 10% additives. Anti wear to provide the load carrying capacity and prevent scuffing of moving parts. Demulsifiers to reduce emulsion formation or for easy separation of water. Pour point depressents to have gravity flow properties at low temperatures. A lubricant has a life. With time its properties deplete and as the properties deplete lubricant fail to lubricate. The following are the basic reasons for the failure of a lubricant. Oxidation of lubricating oil which is the result of the chemically combining of the oil molecules with oxygen of the air. The rate of oxidation increases with the increase in the working tempeartures. Metal and their salts catalyze the oxidation process. Antioxidants additives used for controlling this are of sacrificial type and need replishment with time. Additives in general during use/service get depleted and lubricants lose their functional properties because of this depletion a failure can happen. Lubricant getting contaminated from internal and external sources.